“Apparel Store” suits online garment stores selling clothes, designer wear, Tee’s etc where you would want attractive design options along with the powerful storefront features of Magento. Mutliple image sldiers and a flexible design scheme help you easily create and manage your online storefront. The theme also comes with included PNG files for easy design customization. The homepage comes with a featured full-width slider which can have banners and embedded video clips. A second carousel in the sidebar can be used for your latest products. The rest of the content area comes in a default 3 column grid which can be used for your featured products. The theme also has an opt-in box for easy newsletter subscription in the footer block. A primary multi-level header menu can be used for all you prominent product categories. A separate top menu includes basic account management links. You can also embed internal quicklinks in the footer. Internal pages come with “Shop By” option in the sidebar where you can include custom groupings such as Price Range, Color, Size etc. Users can also create a custom wishlist and can compare between multiple products. The theme displays a breadcrumb navigation trail for all internal pages. The theme has a keyword search facility with a prominent keyword search box in the header along with an Advanced Search facility where users can search with multiple attributes. Within internal category pages users can also choose between grid and list layout options and can also sort the listings. Individual product pages can include multiple images along with a provision for users to submit reviews and product tags. Users can also create a custom wishlist and can also compare between multiple products. The checkout page allows users to redeem coupons, and also has a Shipping and Tax estimator extension which allows users to get a cost estimate based on the submitted location details. The underlying Magento admin panel helps you easily administer your site with a perfect control and ease of customization over your design, layout and storefront options. The theme can be easily administered without any prior technical knowledge. 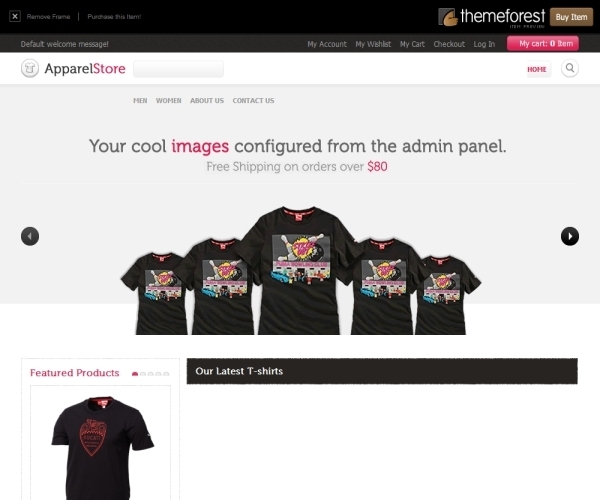 The “Apparel Store” premium Magento theme is priced at $85.